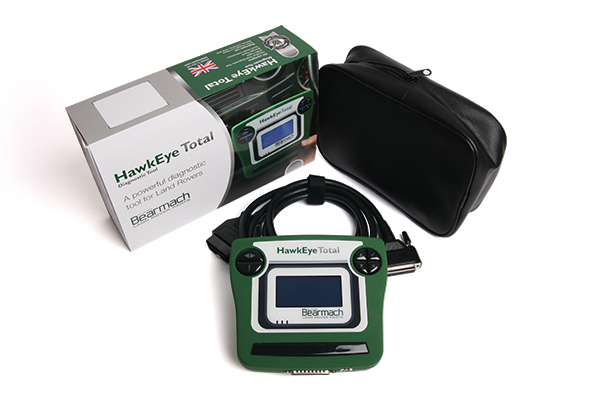 Bearmach’s HawkEye TOTAL is a portable and simple diagnostic tool for home mechanics and professionals alike. The HawkEye Total will assist you in identifying problems and get your Land Rover back on the road as soon as possible. It has the complete Land Rover package installed, and all models (year dependent) are unlocked and ready to use on this unit. The diagnostic tool is robust and comes with its own storage pouch. The keypad has well defined buttons and is powered directly from the vehicle. The clear graphical display is easy to read and features on-screen prompts. The specific applications will allow you to access information from your vehicle. Functionality includes READ and CLEAR fault codes, LIVE DATA, ACTUATORS, and Electronic Control Module data. The HawkEye Total also comes with Bearmach's new 3 YEAR WARRANTY which covers Bearmach's entire branded product line-up. Click the button below to add the HawkEye TOTAL Diagnostic Fault Code Scanning Tool P38 Air Suspension Dongle Adapter, Land Rover / Range Rover. Bearmach HawkEye # BA 5074 to your wish list.